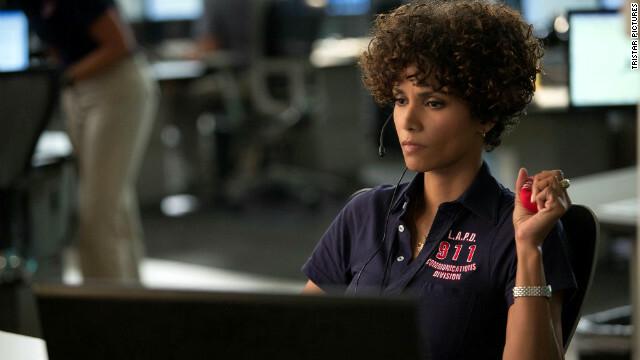 In next weekend's thriller "The Call," Halle Berry plays a 911 operator who fights to rescue a young woman from a vicious abductor. As it turns out, the Oscar winner revealed to CNN that she had to make an emergency call herself during a terrifying home invasion. "I did have to call 911 about a year before I made this movie," Berry said. "I had someone who was attempting to break into my house and when I called I told the 911 operator, 'I think they're in my house.' And from the time I thought they were in I couldn't stop talking; the operator said to me, 'Ma'am, if they're in your house, you must be quiet. Stop talking.' And I could not stop." Although the operator kept telling the actress she needed to be quiet, Berry said she just couldn't do it. But lesson learned: "[N]ext time, if I ever have to call, I know the importance of being quiet and listening to someone." On a lighter note, Berry’s less-than-glamorous hairstyle in the film is getting an amused reaction from some quarters. The 46-year-old, who had a hand in selecting it, explains why she picked something so completely different from her own famous ‘do. “With social media today, and with paparazzi that follow you to the market [and] to school with your kid, people see you, like, all the time," she said. "So it's becoming harder and harder for actors to escape who they really are and have people suspend belief. ... So for me, the first thing that has to go is [my] hair. That's become synonymous with who I am. So it was just about finding a hairstyle that kind of made sense." The character isn't the kind of woman who puts a lot of time into her style, and she didn't seem like the type to have long hair, either. Now whats da story on her cootch hair? I think she is one of the most attractive women in Hollywood. She could wear a clown hat on her head and still look good. I do like her real hair style. It just fits her. Must have been a slow news day, if we are talking about somebody's hair. I agree with everything you just said (and I'm still raving to anyone who will listen about her at the Oscars-just flawless!) ,but I freely admit when I first saw the trailer for this,my immediate reaction was "OK,we let her slide with that bad 'Storm' wig from 'X-Men'. But if she's going to insist on wearing jacked up hair going forward,shouldn't there at least be a website or Twitter feed dedicated to it?" Halle know what she is doing as far as her weight. First of all she watches what she eats for her health. Also she's naturally small but even more she's a hollywood actress. She knows good damn well she needs to keep her body in shape. She's 47 and still getting jobs and looks great. If she gained weight it will effect her life. Just saying. Agree. Also, she admittly has diabetes, so she has to be extra careful with her diet. Never met this woman nor do we know who she is. I don't care what she does with her hair. Just don't do anything to her boobies. i have yet another new mc. I'd let my 12 gauge do my talking for me then.